Environmentally responsible business practices are part of PDA’s core values. PDA makes every effort to reduce their carbon footprint but as an expert source for other businesses, PDA encourages their clients to examine ways they can embrace more environmentally friendly practices. With the rapidly changing technological needs required by information technology and online marketing services, PDA finds it necessary and vital to upgrade computers on a regular basis and makes responsible choices about disposing of out of date electronic items to approved electronic recycle stations. Located in the town of Catonsville, PDA is close to lunch spots and shops. PDA encourages employees to take the extra few minutes it takes to walk to pick up lunch. They also support a Walk to Work practice. PDA utilize commercial printers who use recycled products, wind generated electricity and soy-based inks. Not only has PDA achieved its goal of 100% storage of archives therefore eliminating paper files but utilizing online bill-pay eliminates paper/stamp usage. Marketing firms and many businesses purchase ad speciality items. Many of those items are simply discarded when the imprint information becomes dated. PDA recycles these items by sending them to homeless shelters. In some instances, unused or out of date ad speciality items (ie, notepads, tee shirts, pens with businesses names on them) are shipped to schools in underdeveloped countries where up to 40 students share a single pencil. Smart utilization of office space and associated resources help support a healthy environment. PDA is part of an office share program, which more fully utilizes offices space and energy resources. This recognition follows closely behind PDA’s recertification as both a MBE/DBE and WBE business. Maryland government defines a small business as a for-profit company independently owned and operated and not managed by a larger business. The number of employees and gross sales of the company applying for Small Business Certification are carefully examined to ensure that they do not exceed the specific requirements. Because business information can change rapidly, businesses must be recertified as a Small Business Enterprise every year. Despite these strict requirements, a company undeniably benefits as a small business. Over twenty Maryland state agencies are required to award at least ten percent of their contracts to small businesses. A small business wins one of these contracts by being the lowest bidder. Only certified small businesses are eligible to receive small business procurement dollars. This ensures that at least 10% of these federal agencies’ procurement dollars are going to qualified small businesses. As a certified Small Business Enterprise, PDA Marketing carefully adheres to the requirements. PDA specializes in online and offline marketing. Additionally, their services include web development, search engine optimization, social media marketing, direct mail, creative services, and sale management. Recently, the nationally acclaimed Deliver magazine featured PDA Marketing’s direct mail and design tool, Doodle-Opes, as an unconventional marketing solution for online and offline use. Discover the Secrets to Getting Your Direct Mail Opened – Guaranteed! With direct mail often delivering a 1-3% response rate or even less, it becomes increasingly important to ensure that you’re using a targeted mailing list and have a well-written, attractive letter. Without these things, you’re in for a disappointing campaign and maybe even losses rather than profits. There are other steps you can take, however, to increase the rate at which your envelopes are opened and read therefore increasing the number of people who will respond. With direct mail, your first impression is the appearance of the envelope. When an envelope looks unusual and is personalized, the recipient is more likely to take a second look. Also, you want to make sure that it stands out – consumers have seen it all before from the pre-approved credit card applications to bland postcards. From my experience, working with clients from many different industries, there are five tried and true rules that I follow with each campaign. Postage meters may be the easiest way to prepare your mail for delivery, but it is not going to get you the best response. Spending a little extra time to actually stamp each and every envelope will make it look like you aren’t mass-producing direct mailers or ‘junk mail’. It will seem as though you drove all the way to the post office to pick up the stamps and then spent a while focusing on each envelope and the impression you were making. Many high volume mailers use high-speed inkjet printers to spit out their direct mail quickly and reliably. But the key problem here is that many high volume mailers use it! People have seen it before and can tell the difference when you use a nice quality printer that may take a little more time. Again, it may take time or a few extra cents to stick these on each envelope, but the recipient will appreciate it. Taking time for each customer makes it appear as though you are thankful for their business. Also – think about it – how many direct mail pieces you have received lately that had a personalized return address label? Not many. Most have their name printed in the upper left hand corner, a Pitney Bowes stamp in the upper right hand corner, and a little clear hole in the middle where your address is. They couldn’t even take the time to print your address on the envelope! If you are using your business return address, try putting an individual name instead of the business name. This really makes the piece look more personal. The days of the plain white envelopes are over as are the days of a little logo in the corner. You have got to go crazy, be outrageously creative, get someone to notice your envelope. 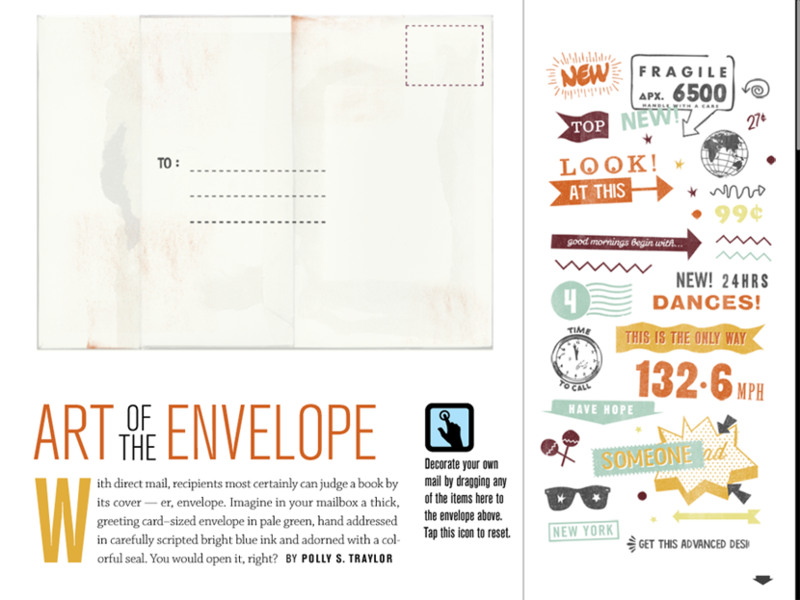 Make your envelope the first thing the recipient notices when they open the mailbox. How do you do it? Use a wild color, draw some ‘unplanned’ doodles on the outside, and make it known that you’re not the average company and this is not the average piece of direct mail. Check out the product Doodleopes® for some examples of what I’m talking about. How many times do I have to say it? Personalize the envelope! Make it look like you spent a lot of time! Find a believable (not fake-looking) hand-written font so it appears as though you handwrote their address on the front of the envelope. 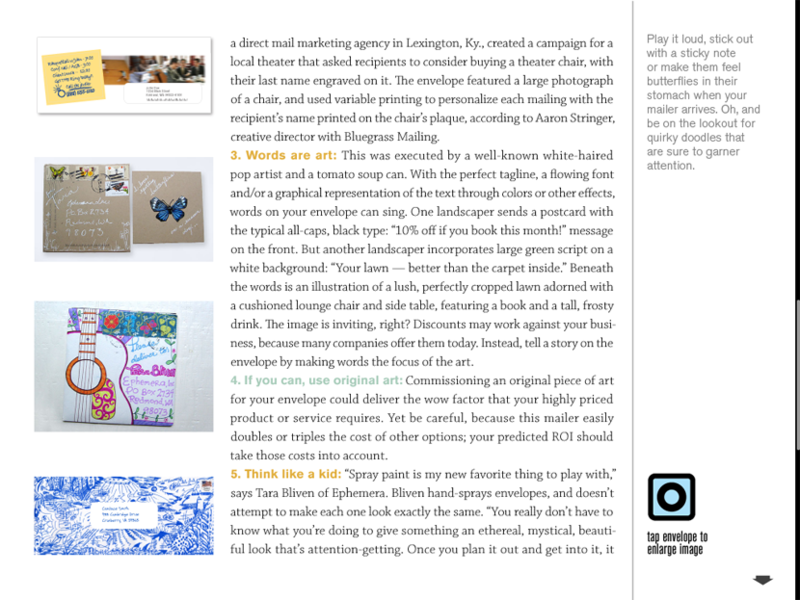 This way, your direct mail piece will look like it came from a friend. If you’ve followed the rest of my tips, the recipient will be so curious as to which company spent so much time personalizing the letter for them that they’ll be excited to open it. And if they don’t need the service right now, you’ll have made such an impact that they may just save your direct mail piece on their refrigerator for next time. About author: Andrea Ratajczak is co-founder of PDA Marketing and developer of Doodleopes®, hand-drawn doodles and outrageous envelopes that are sure to increase your response rates. Conservative estimates state the average American is bombarded with over 600 advertising messages a day with other estimates as high as 3000. With such an enormous number of messages circulating, it is difficult to get someone to stop and take a second look, even though the information in the message may be highly pertinent. Andrea Ratajczak and the PDA Marketing team have devised a way to get a message to stand out among the hundreds or thousands processed each day: DoodleopesTM. 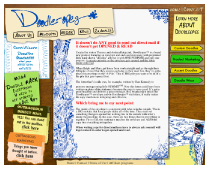 DoodleopesTM are simple hand-drawn doodles and a hand-written font that add a human touch to any marketing message. DoodleopesTM are perfect for use in sales letters and postcards or for non-business use like birthday invitations, blogs, even everyday stationery. The ingenious idea for DoodleopesTM began with Ratajczak’s first post-college job search. On an application, she was required to give a handwriting sample so that a personality profile could be built to determine her sales potential. As it turns out, she scored a 100% as a perfect match for a persuasive personality. Ratajczak chose not to take that job, but has turned her handwriting and love of doodling into an easy way to boost copy. Years later Bill Glazer and Dan Kennedy met and hired Andrea’s marketing firm PDA Marketing. With the help of the “Andrea” font, they launched their information-marketing legacy by incorporating the font in their handwritten sales letters. Since then, Andrea’s own individual marketing clients have benefited from using this compelling font in their sales letters, postcards, emails, websites, information products, blogs, and brochures. Now, Ratajczak has packaged her handwriting font and fun doodles together so that everyone can reap the benefits of DoodleopesTM as copy enhancements. These copy boosters draw attention to the copy just as a speaker uses voice inflection to emphasize certain ideas. Most people today just read past most messages because they are inundated with so many. These tools help keep copy fresh and create little surprises that hold the attention of the reader. Next to the most obvious eye-catching feature of DoodleopesTM, one of the key draws is the ease of use. Unfortunately, most projects must be sent away to costly graphic designers to achieve such results. Upon first use, it is obvious that DoodleopesTM do not take as much time or as much money as marketers are used to spending on direct mail initiatives. To use DoodleopesTM, one must only know how to use copy and paste. The doodles are images that will just be inserted into already written copy to draw the recipient’s eyes to the most pertinent information. For example, if you have an amazing fact in your copy that you want to be sure is noticed, you can add a doodle that says “AMAZING! !”, “INCREDIBLE” or “KAZAM”. If you have an offer that you want to emphasize, you can use a certificate border to make sure the recipient sees the special bonus! Or, even if you just want something to be highlighted, you can add a few colored exclamation points or smiley faces after it. To view already snazzed-up project and other sample doodles, visit www.pdamarketing.net. If you consider that 44% of direct mail is thrown away unopened, it is hard to imagine what percentage is opened yet thrown straight in the trash. So, there are multiple steps involved in getting the recipient initially interested in your message and then inciting action. To attract as well as hold the consumer’s attention, DoodleopesTM are available on the letter itself to draw attention to the most important points but also on the envelope to convince the recipient to actually open the letter. Imagine an afternoon when you arrive home from work and walk to the end of the driveway to retrieve your daily mail. You notice that there are two envelopes there: both from companies you have never heard of. One of the letters is in a plain white envelope; the other is in an envelope covered in crazy colored doodles with a seemingly hand-written address label. Obviously, you’ll open the doodled one before the boring envelope (that already puts the envelope in the highly coveted 56%). And, on the inside, you’re offered a gift certificate! Surely that one is not going in the landfill. Or if you’re a mom who just wants to make the coolest birthday invitations without spending lots of money year after year to buy pre-made ones at the local pharmacy, DoodleopesTM provide you with enough graphics to make hundreds of unique birthday invitations that will make you the talk of the neighborhood. Ray Ratajczak left behind more than just his family name. He left behind a future for his daughters. Ratajczak, who had worked in commercial television production for more than 30 years, was the inspiration behind PDA Marketing, founded in 1993 by his daughters, Theresa and Andrea Ratajczak. 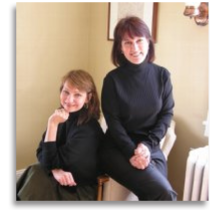 When their father lost his battle with cancer at the age of 54, Andrea and younger sister Theresa decided to open a full-service marketing firm. Before their father’s death, Andrea was involved in direct mail and Theresa worked in television production. PDA is currently working on marketing what Andrea calls “Baltimore’s newest ad phenomenon,” a type of rolling ad, where advertising messages scroll electronically through vehicles. What will it take to get your direct marketing message noticed? Although traditional marketing and advertising are still in vogue, studies show that unconventional marketing methods are being utilized more and more to deliver a dynamic message. Direct mail is not exempt from the changing media landscape; in the future, it will take on new shapes, sizes and looks, and incorporate an interactive online component. The main purpose of marketing and advertising is to link the message to a specific audience. Businesses are facing a more insular customer climate, and making that connection is proving more and more difficult. Do-not-solicit requests, answering machines, caller ID, direct viewing options, etc., provide a protective barrier between the commercial message and the consumer. It is essential that businesses examine the most direct link to their propective customer. Direct mail is still a viable method for targeting potential audiences efficiently and effectively. Consumer patterns include visiting their mailbox daily. Direct mail is not obsolete. It is not, however, without its challenges. Direct mail can still attract your audience’s attention by personalization and cusomization. “Personalization allows direct mail, which traditionally has less than 2 or 3 percent returns, to obtain returns greater than 5 percent. Some of the more effectively designed programs can achieve returns of 20 to 30 percent,” wrote Evan M. Bloom in the April 2007 issue of Small Business Technology Magazine. Direct mail is changing – with new textures and unusual, high-value packaging. It can take many different forms, such as postcards, brochures, coupons, samples, bookmarks, flyers, business cards, letters or magnets … even baby diapers. From whacky to wild – anything goes. Whatever the format, the main goal is to attract the consumer’s eye. Using a variety of response mechanisms, direct mail remains the best method to achieve measurable results. Careful examination of a business’s current customer base will reveal consumer patterns that can be replicated for list purchase criteria and used for new customer capture. Ranking of the client list from best customers to next best will help focus marketing efforts and may reveal ways to even further customize sub-messages. After a business establishes a relationship with a client it is essential to “touch” and then “retouch” the consumer. Repeat business can make up to 80% of the total business. That percentage can climb even higher with a referral statistic included. Securing a unique niche among worldwide advertising and marketing companies, PDA Marketing services a diverse range of industries. innate understanding of the marketplace and holds high marks for successful implementation of marketing campaigns. No other firm delivers the same results, time and again, on time and under budget. From direct campaigns to Web design and marketing strategies, to new online marketing techniques and information dissemination, PDA Marketing has a clear understanding of what combination of resources will reach the desired target audience. Information product marketers post glowing remarks about the combined skill and talent that PDA Marketing delivers to their industry. Specializing in the design and creation of information products, PDA Marketing creates award-winning, on-target looks and feels for information product developers as well as masterfully design marketing pieces, follow-up materials and funnel pieces. Information product giants like Dan Kennedy, Bill Glazer, Zig Ziglar, Sean Greely and Eric Ruth share confidence in PDA Marketing’s work – because they are valued clients who have reaped the benefits of the company’s focus on creativity and innovation. Whether based on the immediacy of business, or the need for long-range planning and growth, PDA Marketing works closely with its partner clients to create synergistic solutions, creative campaigns and in-depth development of innovative concepts. Their approach is results based. Andrea Ratajczak, Vice President of PDA Marketing stresses a result-driven approach, and her ability to move and motivate clients routinely meets with success. Whatever marketing obstacle she is faced with, she meets it head on, doing whatever necessary to achieve the marketing directions and goals set forth in the project. Theresa Ratajczak drives the creative design energy that fuels the concepts unmatched in the industry. “Creating illusion and metaphor from the viewer’s perspective helps me approach each project,” says Theresa Ratajczak. “We do good work, and we do it with integrity. Client satisfaction is our goal and we do whatever it takes to get the job done,” says PDA Marketing President Theresa Ratajczak. PDA Marketing specializes in media placement, public relations, development and mapping of advertising plans, production of multimedia advertisements and creation of promotional tools for both general consumer and business-to-business clients. PDA has a complete in-house graphic design department and creative team. They are skilled in graphic design, website optimization, website design, product and identity packaging, research and information marketing, outdoor creative such as billboards, sales letters, broadcast, audiovisuals, annual reports, product development, newsletter design and layout, virtual product designing such as web banners and multimedia brochures, magazine design and layout and much more. 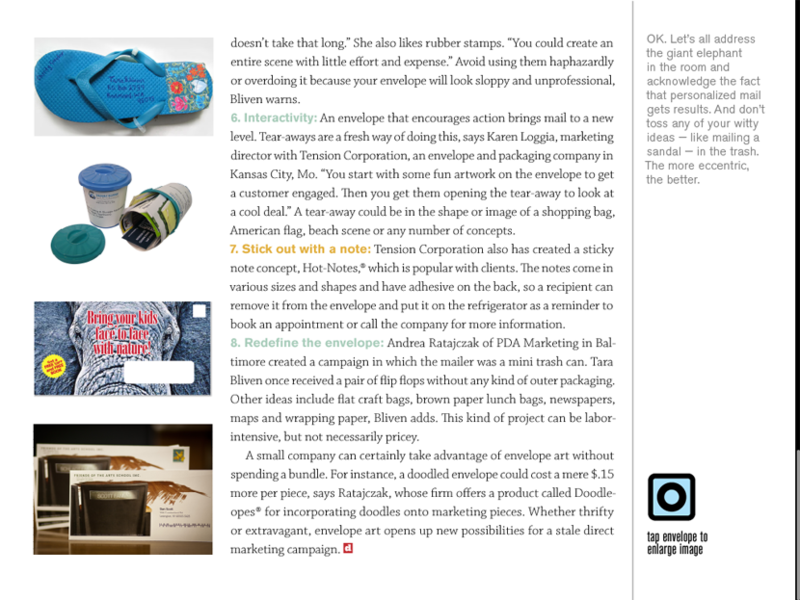 One of their most comprehensive services includes direct mail campaigns in which they’ve created numerous unique direct mail products as well as fully exploiting the idea of “lumpy” mail. 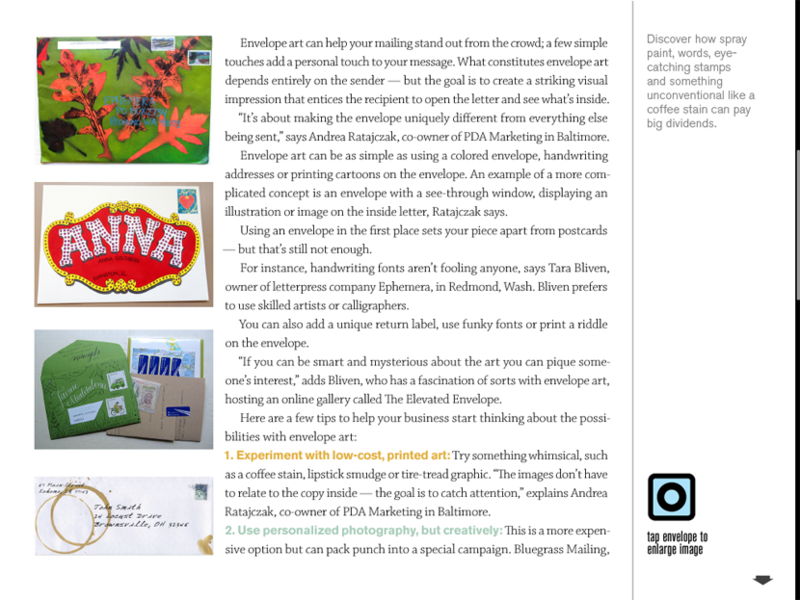 The Absolutely Free Mailer attracts attention with its lumpy component and free give-a-way. Doodle-opes is another innovative mailer in which distinctive doodle designs are inscribed on envelopes, letterheads, flyers, invitations, sticky notes, or more. The Floor Mat is an unusually large mailer with a measurement of 17 inches x 20 inches. “It’s all about solving problems. Whether it’s creating an identity or designing a direct mail campaign that actually gets noticed, we are here to work side-by-side with our clients. Professional, pleasant and willing, we take each project personally,” says Andrea Ratajczak, Vice President of PDA Marketing. PDA Marketing has exclusively engaged in a social media marketing campaign in efforts to target and build geographic and social relationships between friends through Internet networking websites such as Myspace and Facebook as well as through mobile text messaging. PDA Marketing’s clients consist of many different industries ranging from healthcare like Bon Secours Baltimore Health System, to education such as Stratford University, and to outdoor bill boarding with Clear Channel Outdoor. Other industries included are restaurants, retail, hardware, real estate, transportation, automotive, software, and associations. Other clients PDA Marketing has worked with are Market Center Merchants Association, Howard County Living, Dan Kennedy’s Renegade Millionaire, Marathon Power Equipment, Gold’s Gym, Aquarium Products, Fox 45, Villa Julie College, Advance Realty, Maryland Transit Association, Venture Trailers, and many more. “We do good work, and we do it with integrity. Client satisfaction is our goal and we do whatever it takes to get the job done and for our customers to be happy,,”says Theresa Ratajczak, President of PDA Marketing. PDA Marketing is also certified as a Women Business Enterprise and a Minority Business Enterprise by the Maryland Department of Transportation.